Well howdy! How do you do? This little strawberry would like to welcome you to her patch! It's a pretty great place to spend an afternoon—everything is lush, green, sweet, and fun! She's basically the head strawberry around here, and she's the perfect addition to any summer festival, school play, or even a night spent trick-or-treating! Sure, you could argue that other fruit costumes are just as cute, but why would you try? 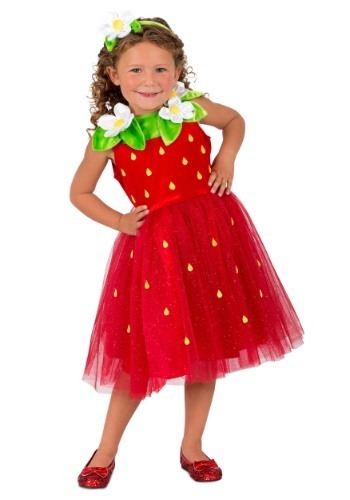 This Girl's Strawberry Sweetie Costume has all the charm of dressed-up dramatic flair, but it is also made to look like a sweet lil' strawberry. And if there is one thing your girl loves more than anything else, it's strawberries! She'd even opt for 'em over chocolate (whoa! That's really saying something). So give her the best of both worlds—fancy flair and cute fruit—and let her become her favorite treat this Halloween. She may thank you by saving a special place for you in the strawberry patch! 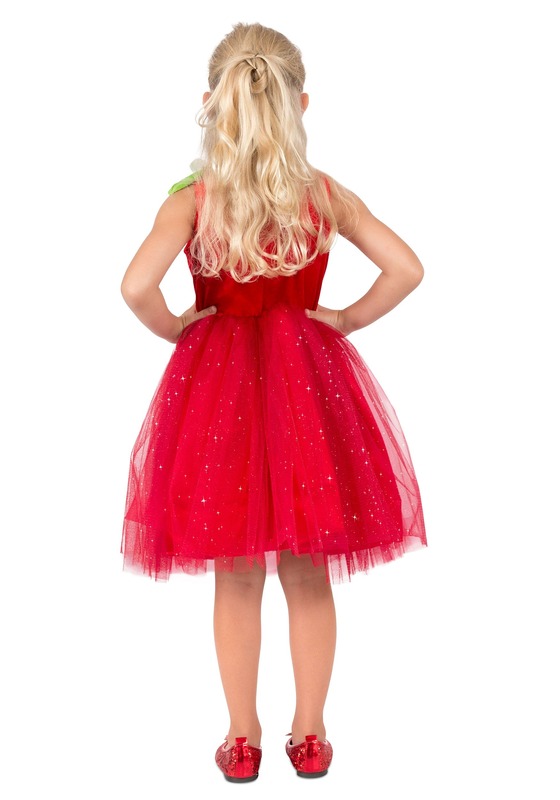 This is a berry-red dress, speckled with allover "seeds" and featuring a shimmery, sheer mesh layer over the skirt. There's a defined waist, a fitted bodice, and a nifty green leaf collar adorned with strawberry blossoms. The headband matches this detail, and the overall look is sweet and snazzy! Dress the whole family up as wholesome fruit and veggies, or just let this little one delight all on her own. It's a foolproof costume, any way you slice it! Fresh strawberries are rare come October, so your little girl will be a welcomed sight amidst the gourds, dried corn, and hay bales! And who knows, as she rings doorbells to trick-or-treat, her fresh appearance may just earn her an extra piece of candy or two. Of course, she'd rather have fruit snacks, but she's not picky!